UB’s new medical school, set for completion in 2016, will feature state-of-the-art labs and classrooms for educating and training physicians. A major gift from The John R. Oishei Foundation significantly boosts the University at Buffalo’s plans to construct a state-of-the-art medical school, equipped with the best medical technologies, labs and classrooms for educating and training physicians. “This important gift will accelerate creation of the region’s first and only academic health center, helping Buffalo develop into an international center for medical research, education and patient care,” says Michael E. Cain, MD, vice president for health sciences and dean, School of Medicine and Biomedical Sciences. He welcomed the Oishei Foundation’s participation in “shaping a bold era of progress, discovery and promise” for the medical school. “With this $5 million gift, we join UB as fellow catalysts for change that will dramatically enhance our community’s economic vitality and quality of life,” says Oishei Foundation President Robert D. Gioia. Oishei Foundation Board Chair James Wadsworth agrees. “The new medical school will strengthen the campus, generate regional economic growth and help to renew downtown Buffalo’s urban vitality,” he says. The facility is expected to generate immediate, long-term, local and regional economic benefits. It will bring 2,000 faculty, staff and students to downtown daily, spurring retail and housing development as well as incubators and research parks. The new medical school has received funding from a mix of sources, including state support provided by Gov. Andrew M. Cuomo through the NYSUNY 2020 legislation. “Private donations are important to the success of the new medical school, and we’re grateful that the Oishei Foundation has offered such generous support at this critical time,” says Nancy H. Nielsen, MD, PhD, senior associate dean for health policy. The Oishei Foundation’s support has helped leverage additional funding from competitive sources, while spurring research discoveries and advances in faculty and staff recruitment, education and the development of the Buffalo Niagara Medical Campus. The foundation has supported numerous UB initiatives, including UB’s New York State Center of Excellence in Bioinformatics and Life Sciences, the Department of Biomedical Engineering, the Interdisciplinary Science and Engineering Partnership (with the Buffalo Public Schools and community partners) and Arts in Healthcare. UB aims to raise a total of $50 million in private funds. A key objective is to hire faculty members who are top physician-scientists working in needed clinical specialties that the region has lacked, Cain notes. These specialists, in turn, will help develop medical training programs in important new fields, contributing to improved health care for the region and beyond. Toward that goal, the number of medical school faculty has already increased by nearly 60 — from 688 in 2011 to 747 in 2013. By 2016, a total of 100 new faculty positions will be filled, supporting a 30 percent increase in UB’s medical school class, or an additional 40 medical students per year. 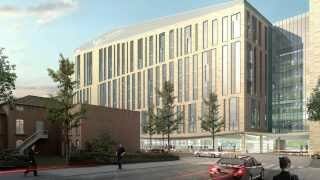 The state-of-the-art, $375 million medical school at Main and High streets is set for completion in late 2016. At more than a half-million gross square feet, the seven-story building will be one of the largest constructed in Buffalo in decades. The new school is expected to raise the quality of medical students at UB as well as attract top biomedical researchers and entrepreneurs. Locating the facility on the Buffalo Niagara Medical Campus allows the university and its nearby hospital and research partners to easily collaborate. “Such collaborations will advance scientific discoveries that respond to the critical issues we face, improving patient care in our region and better preparing our students to be global leaders,” Cain says. Partner institutions include the UB Clinical and Translational Science Institute, Kaleida Health’s Gates Vascular Institute, Roswell Park Comprehensive Cancer Center, the planned John R. Oishei Children’s Hospital and Buffalo General Medical Center.